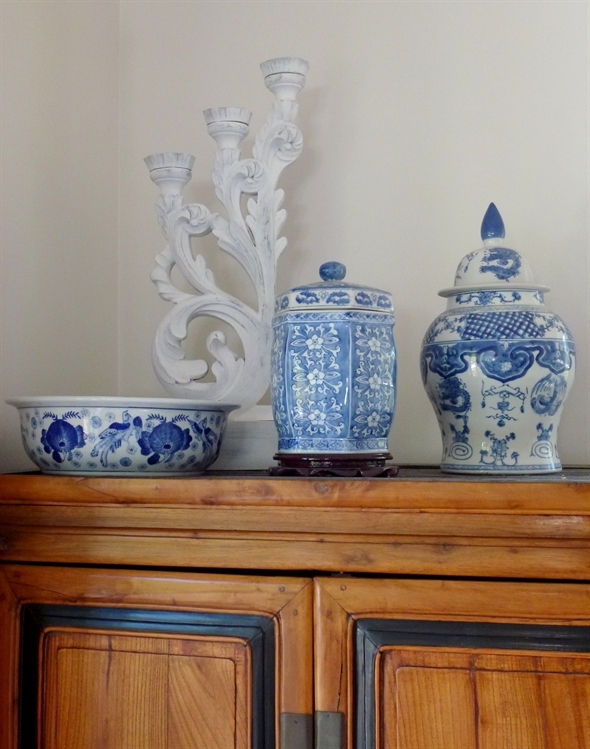 Blue and white is a timeless combination, and works well most interiors, I have a number of pieces of blue and white china I collected while living in Asia and have grouped these together on top of my Korean cabinet (see below). 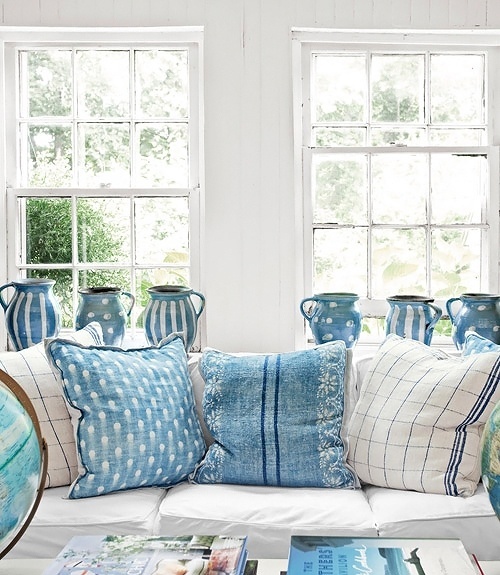 A blue and white palette can be used to create a classic, country, cottage,or coastal look to an interior. Today I want to share some varying styles using this palette, from soft turquoise blues to the more traditional French Blue, I hope these inspire you to experiment a little with blue and white. A soft country look with linens and naive pottery. Fellow blogger Kim from Savvy Southern Style's delightful sun room. I love the blue and white plates displayed on her walls. 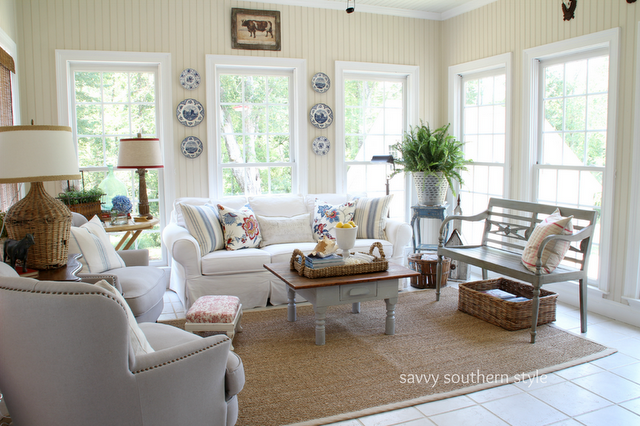 A corner of the sunroom where Kim she sits with her laptop and writes for her blog "Savvy Southern Style". Visit Kim's blog to see her home tour. The blue ceramic jars add impact to this uncluttered space with a distinct Mediterranean look. 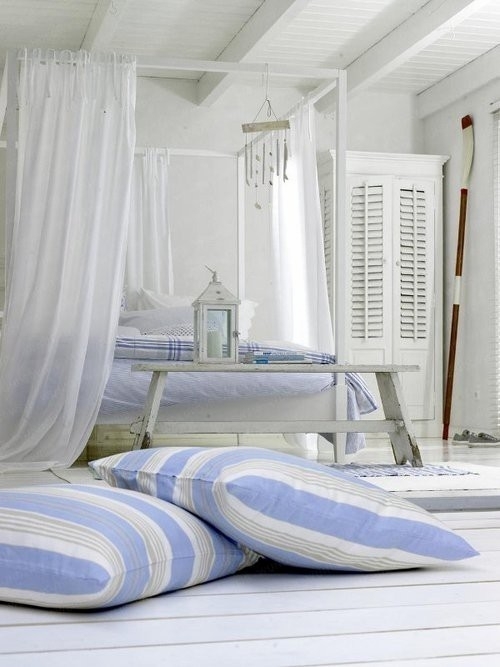 Stripes and soft blues work wonderfully against a background of white for a coastal look. Lots of interest in this room with a mix of shades of blue and earth tones. I love the wall sconce's what a great way to show off your most precious items. 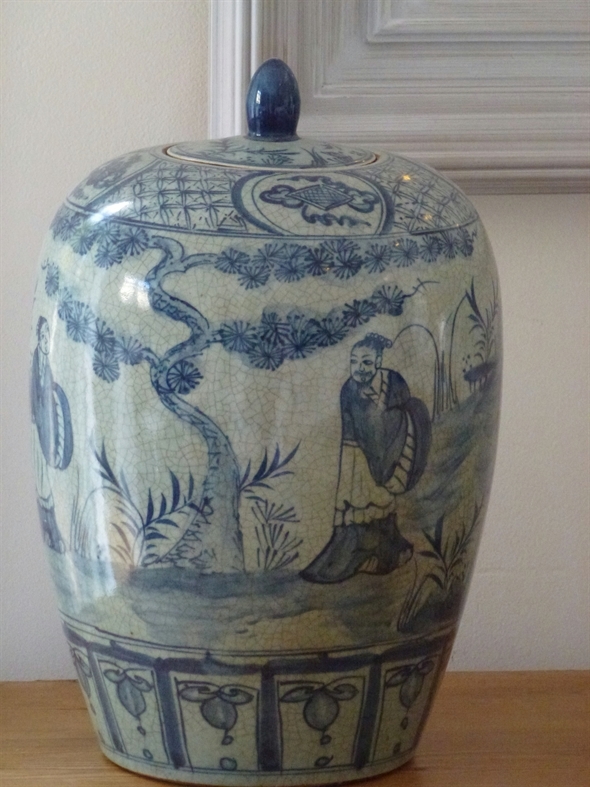 This lovely old Korean cabinet was purchased in Abu Dhabi of all places and made its way back to NZ in my shipment. 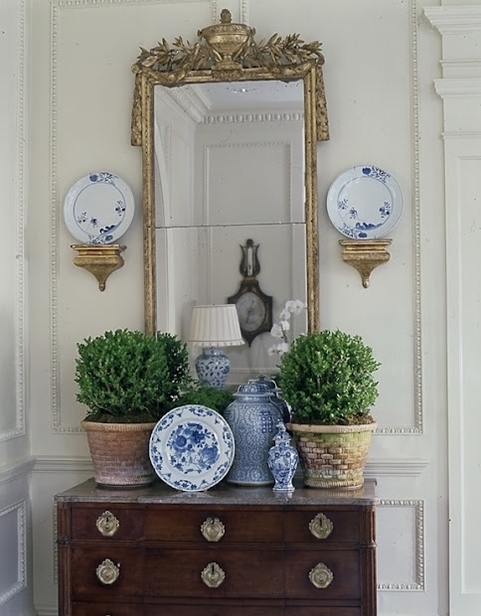 Inexpensive blue and white can look effective when grouped together. My favourite ginger jar, unfortunately not a genuine antique but a very good reproduction as it is hand painted and not transfers... I would love to know the story behind the figures painted on it. Thanks for the link to my blog. I LOVE your pillows in that first shot and your cabinet is amazing. What beautiful wood. Thank you for your images Kim, such a lovely room you have. 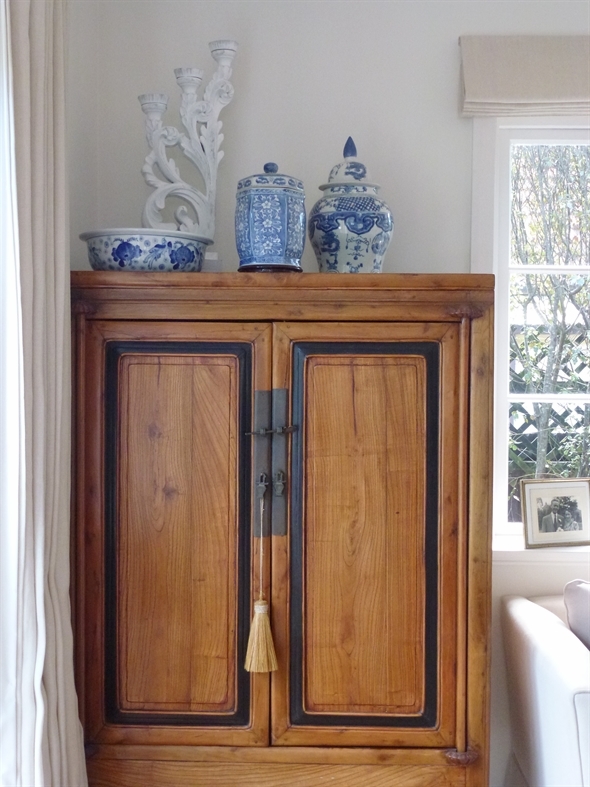 Glad you like my cabinet, it has been hauled half way across the world as I loved it so much. Unfortunately those pillows are not mine, that shot is via pinterest, however, I agree they are beautiful and add such a fresh feel to the sofa. Thanks for visiting Kathryn and taking time to comment. I would be happy to link up my post. Thanks Vic, I love Anna's shop, I will have to check out her blue and white displays. Ohhh! Blue and earth tones is my favorite color combination. Сhocolate and turquoise :). Thanks for stopping by Victoria, Chocolate and turquoise would work fabulously! So calming and beautiful. Thanks for sharing such a sweet collection of ideas. Thank you for your comment, sometimes it's nice to theme a room even a bathroom with blue and white if you don't have these colours elsewhere in your home. I plan to make one of my bathrooms a touch of Morocco but the rest of my house is an eclectic mix of French and classic with a very contemporary kitchen which I hope to do a makeover on and give it a bit of "country" later this year. Exactly Tami, thanks for stopping by. First let me say that your blog is a great source of inspiration! The antiques market that you saw in the pictures is actually located in Berlin, Germany. We went there this summer with my husband and we both loved it. First of all let me say that your blog is a great source of inspiration! The antiques market that you saw in the photographs is actually located in Berlin, Germany. Lovely blue and white :) Since I moved to Thailand 6 months ago I painted my bedroom and dressing room a lovely shade of blue...and want to add mostly white and blue decorations :) This blog (just foundyou BTW) is a lovely source of inspiration, so thank you.